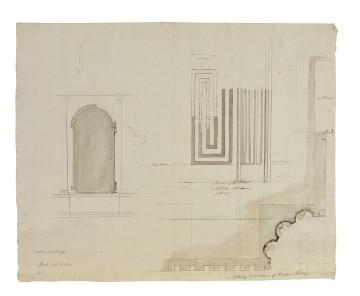 Drawings 42 and 43 show the ornament for the windows on the south and north walls of the Accountants Office. 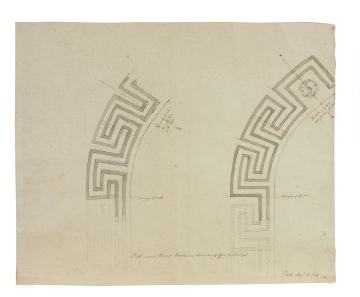 The full size detail is a plan of the window reveal and the framing incised line ornament, as shown in the two elevations of different scale. The corner is a concave quarter-circular shape that has been altered to include three flutes with cabling. The design is a playful use of circles, which would have responded to the light flooding through the large windows. The fluted concave corner resembles an inverted plan of a fluted column.